To make your website visible to everyone through the internet, your web files should be stored in high-performance computers called servers. Web hosting is a service that helps you in this process and allows your website accessible to anyone via the internet. Sharing of cost and space is what a happens and as a result, a large number of websites are hosted on a single server in this case. Hidden facts: In fact, there is no definite number of websites that a single server may host, the number could be in the tens, or the hundreds or even in the thousands and overselling due to the highly competitive and saturated nature of the market is guaranteed. -How do you feel when you have to share your room with your siblings or cousins or for hostel people, roommates, if the space is less, you definitely feel congested, same is the case in sharing of servers, you’ll have to share a limited space with a lot of other people who you are not even aware of. -Let’s say you’re experiencing moderate traffic while Sundaran Pillai who is sharing the server with you gets a sudden burst of traffic. A neighborhood’s traffic can have a direct impact on your site, causing it to lag with pages that take forever to load thus hampering the loading speed of your website. Remember, every visitor has only 10 seconds of attention time, if your website does not load in that stipulated time, you may lose your prospect. -Overuse of the server resources by a single user can lead to multiple problems for the other shared server users. And one amateur user among the group is enough to misuse. If he restarts the server to solve his issues, even your website will have heavy downtime. -Your neighbor's issues are your issues. As I told, the resources are common to all users. If any of the users on a shared server is consuming high traffic this will affect all users on that server resulting in Poor Performance, Slow Speed, Resource Limit Errors. -ALL of you will have a Single IP address, it is shared hosting so other members can host same category and content sites in that same IP (Let’s assume that they have uploaded some vulgar images and content). Then Your Site Will be Affected by Google Manual Action and the funny part is you will be blocked by google for someone else’s mistake. -Crucial aspects of web hosting are definitely the amount of disk space and bandwidth and in this case, you can reach the upper limit within no time. It is the latest technology, very much innovative, trending and scalable, hence capable of handling large high traffic as well as shrinking to lower traffic scenario by allocating lower resource depending on the demands of their website, and you need to pay only for what they use. 1. Cost effective: Extremely affordable for small company owners. 2. Reliability: quick failover mechanism - if a server fails, hosted applications and services can easily be transited to any of the available servers. You can tap into the services as much as you need. There is no upper limit for availing resources. Disadvantages: Managing cloud servers is complicated. You will need a Linux administrator, IT pro to take care of it at many times. It starts with the simple truth that every cloud has to be managed by someone. 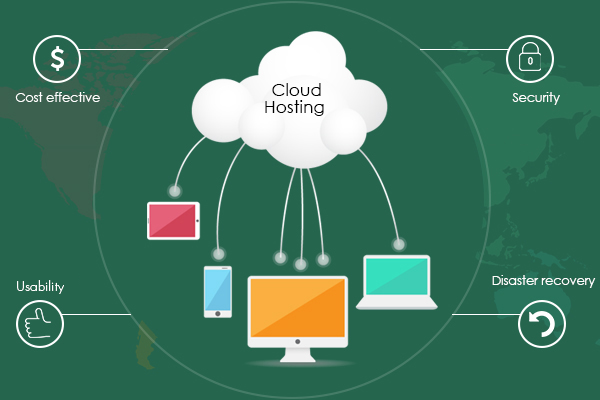 We offer you Completely managed cloud hosting services. You don’t have to worry about complex tasks & management of cloud infrastructure. We take care of server glitches, downtime and assure you 24/7/365 with 99.99% uptime. Quick load time, Unlimited space (Fair usage policy), Zero loss of data is what we guarantee. Make sure you don’t forget to ask about this critical aspect of web designing company you choose to get your website done. To know more about us Click here!